허자은, 박재희, 김유리, 김혜경, 이민수, 김정현, 고광석,(2018).한국인 칼슘 섭취 실태와 관련 요인.한국식품영양과학회지,47(3),328-336. 본 연구는 제6기(2013~2015년) 국민건강영양조사 자료를 이용하여 6세 이상을 대상으로 한국인의 칼슘 섭취 실태와 칼슘의 섭취 수준을 평균필요량(EAR) 이상 그룹(Over)과 미만 그룹(Under)으로 나눠서 두 군의 섭취에 영향을 미치는 요인을 분석하기 위해서 실시되었으며 그 결과는 다음과 같다. 칼슘 평균필요량 이상 섭취하는 대상자의 비율은 28.0%, 남성의 비율은 29.5%, 여성의 비율은 26.5%로 유의적인 차이가 났으며, 특히 여성 12~18세와 65세 이상에서의 Under 그룹의 비율이 남성에 비하여 더 낮았다. 칼슘 섭취에 영향을 미치는 인구사회학적 요인으로는 성별, 가족구성원 수, 결혼 상태, 가구 소득수준, 교육수준, 직업이 유의적인 차이를 나타냈고, 건강 관련 요인에서 음주를 하는 경우에 칼슘 섭취가 유의적으로 높았다. 체중 조절 노력이 없는 대상자일수록 그리고 주관적 체형 인식에서는 매우 마르거나 매우 비만이라고 생각하는 대상자에서 칼슘 섭취가 유의적으로 낮은 반면, 질병 관련 요인으로는 골관절염 현재 유병 여부와 최근 3개월 30일 이상 요통이 있는 경우에만 칼슘의 섭취가 유의하게 낮게 나타났다. 영양 관련 특성에서는 아침식사 빈도, 점심식사 빈도, 외식빈도, 영양 표시 인지여부와 영향 여부, 식사 장소, 매식 여부에서 칼슘 섭취 수준에서 뚜렷한 차이를 나타냈다. 1,000 kcal로 에너지 섭취고려하고 성, 연령 그리고 음주로 영양소별 차이를 확인한 결과에서는 지질, 인, 나트륨, 칼륨, 비타민 A, 티아민, 리보플라빈, 나이아신, 비타민 C의 경우에는 섭취량이 Over 그룹이 Under 그룹에 비하여 유의적으로 높았지만 탄수화물은 섭취량이 유의적으로 낮았다. 에너지 섭취를 고려하여 식품군별 섭취에 따른 칼슘 섭취에서는 Over 그룹과 Under 그룹 모두에서 우유류, 채소류, 어패류, 두류, 해조류 순으로 칼슘 섭취하고 있었다. 또한, 두 그룹에서 우유류와 어패류의 섭취를 통한 칼슘의 섭취 비율의 차이가 1.9~2.4배로 가장 컸다. 본 연구 결과를 통해 한국인 72% 정도가 칼슘의 평균필요량 미만으로 섭취하며, 칼슘 섭취 부족이 심각한 수준임을 확인할 수 있었고, 성별, 연령별, 소득별, 생활환경과 식사 패턴, 다빈도 식품이 칼슘 섭취에 영향 요인으로 작용함을 알 수 있었다. 칼슘 섭취 수준이 만성질환, 뼈건강(11-13) 등 여러 질환에 영향을 주는 요인으로 확인되고 있는 만큼 질적, 양적인 칼슘 섭취 수준을 높이기 위한 다양한 식생활 프로그램과 식품의 개발이 필요할 것으로 생각되며, 나아가 정책적으로 칼슘 섭취량 증진을 도모하기 위한 시도도 필요할 것으로 생각한다. 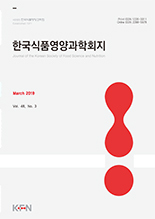 This study was performed to investigate the consumption status of calcium with related factors among Koreans based on the sixth stage of the KNHANES (2013∼2015). The study included 17,875 subjects (≥6 years old) who participated in a 24 h-diet-recall. Calcium consumption data of all participants were statistically compared with possible influencing factors such as demographic factors, nutritional factors and disease-related factors. The results were expressed as ‘Under’ or ‘Over’ depending on the calcium consumption status of the participants compared to the estimated average requirement (EAR) for calcium in the Dietary Reference Intakes for Koreans (2015). The Over male ratio was 29.5%, while that of the female ratio was 26.5%. Additionally, the number of respondents who consumed less than the EAR was significantly lower among females, especially those between 12 and 18 years of age and over 65 years of age. Moreover, gender, marital status, number of families, household income level, alcohol consumption, effort to control weight, subjective body recognition, osteoarthritis, back pain, morning and lunch meal frequency, external meal frequency, eating place, and eating type significantly influenced calcium consumption status. In addition, carbohydrate, lipid, phosphorus, sodium, potassium, vitamin A, thiamin, niacin, riboflavin, and vitamin C were significantly higher in Over group. Korean calcium intake is very low (Over group average=28.0% and Under group average=72.0%, but food that provides calcium to Koreans is limited. Therefore, it would be necessary to develop programs to improve eating habits and food as well as to provide governmental policy regarding improving calcium consumption of Koreans. Cashman KD. 2002. Calcium intake, calcium bioavailability and bone health. Br J Nutr 87: S169-S177. Choi MK, Kim HS, Lee WY, Lee H, Ze KR, Park JD. 2005. Comparative evaluation of dietary intakes of calcium, phosphorus, iron, and zinc in rural, coastal, and urban district. J Korean Soc Food Sci Nutr 34: 659-666. Han JS, Choi YH. 1998. A survey on the frequency of calcium source foods and the calcium intake of elderly people. J Resource Development 17: 147-155. Han JS, Lee YJ, Choi YH. 1998. A study on the preference for calcium source foods, recognition and calcium intake of a middle-aged people. Korean J Soc Food Sci 14: 33-43. Joo NS, Dawson-Hughes B, Kim YS, Oh K, Yeum KJ. 2013. Impact of calcium and vitamin D insufficiencies on serum parathyroid hormone and bone mineral density: Analysis of the fourth and fifth Korea National Health and Nutrition Examination Survey (KNHANES Ⅳ-3, 2009 and KNHANES Ⅴ-1, 2010). J Bone Miner Res 28: 764-770.